.. The neighbors know that when the hoppers arrive it signals the impending start of Fall Fishing in Yellowstone Country. .. Soon we'll be asking the question: "Will it be warm enough for the hoppers to be a factor in fishing?" .. Already the meadows are beginning to show a bit of golden threads among the green. The bison are nervous and covering the world with clouds of dust. It's a week or two early this year but the turning point is here. .. This weekend, given our wonderfully cool summer, should provide perfectly glorious fishing. .. 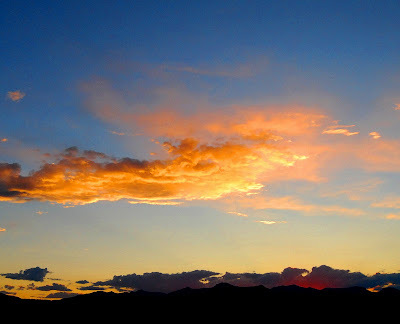 There are still a few good mayfly hatches, there are spinner falls, there are caddis everywhere, hoppers are hopping, terrestrials are dropping, the clouds are scudding along with merry abandon, and the sun is setting further to the south. .. The rivers are accessible. The lakes are low. and snow melt is finally dwindling. 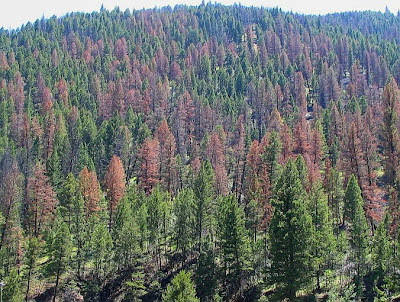 The only down side is that, with Fall just around the corner, the drying forest increases the possibility of fires. 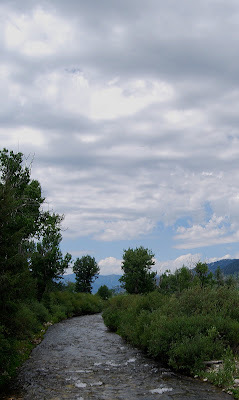 This sort of damp cool summer, (so far it has kept the fire possibilities low to moderate,) - is a good thing in the high country. .. 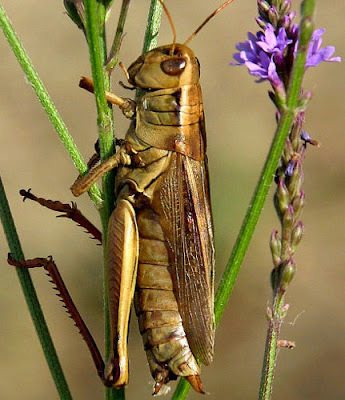 The hoppers in most of Yellowstone National Park, and on our block as well, have finished their final molt. They have begun to commit suicide in creative ways: drowning, windshield impaling, Harley splatting, etc. This bodes well for the fly fisher. We suggest that fishing will be excellent all weekend long - elbows be damned! .. 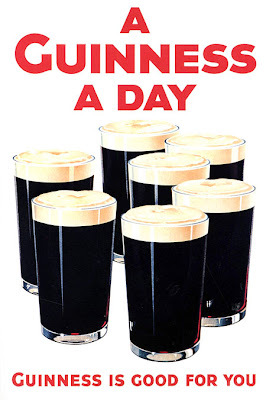 The BBC reports that Guinness Stout may have medicinal value. .. Some lucky dogs were tested in a medical experiment, (PETA ALERT!) and found to have better clotting resistance than the unlucky dogs, (PETA ALERT!) that drank lager rather than stout. 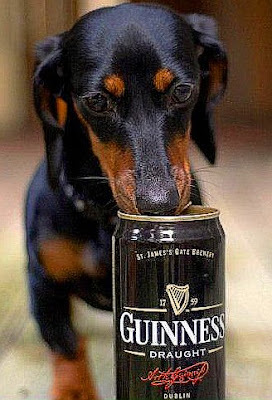 .. Of course the leprechauns in the neighborhood have always maintained that Guinness Is Good For You. .. The research team from the University of Wisconsin, (of course,) concluded that a pint of the black goo will do the same for you as a slug of aspirin. It appears that the alcohol combined with the antioxidants in Guinness is just as good as the aspirin. MY MY! .. Just a brief note to let you know that the trail realignment and improvement along Fan Creek is approaching completion. .. 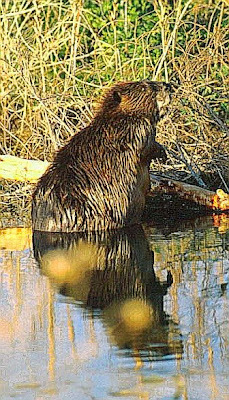 The return of the beavers, and their impoundment seems permanent. .. The NPS has chosen to honor this structure and it's expanding pond by adjusting the trail realignment to avoid the feeder streams and seasonal trickles that were previously crossed by the trail. .. Outfitters with stock will soon be able to use the new trail. Fishers with legs can use it now! We look forward to a mature beaver pond and a captive audience for some exuberant dances in the near future. .. The beavers were a happy coincidence that coincided with the 10 year "Trail Restoration" project funded by the Yellowstone Park Foundation. You can investigate this initiative HERE & HERE. .. Many of the beavers in the neighborhood are bank dwellers. We are pleased to see this innovative pond building & dwelling initiative on the part of the busy little rodents. And we also hope that they capture some hungry native trout in the process. 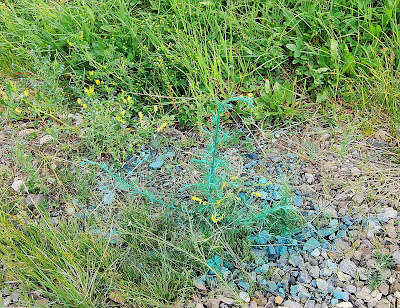 .. Perhaps this will aid the preservation of some native cutthroat trout in the little valley. .. 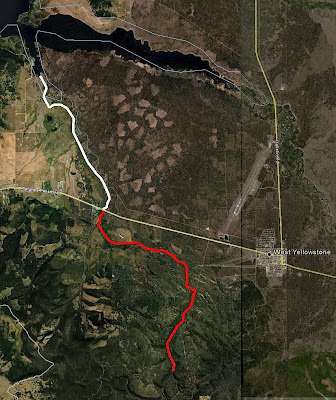 The Wild Fish Habitat Initiative, (#1, #2,) has had a stuttering history on Fan Creek and it's environs. 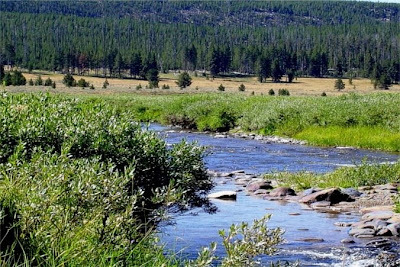 .. Invasive species, (such as Brown Trout & Rainbow Trout,) have been, (and continue to be,) protected by the NPS to the detriment of our natives. .. These foreign invaders, in Yellowstone National Park are, sadly, cherished by indiscriminate fly fishers and feather merchants alike. .. It seems that the lesson of foreign char in Yellowstone Lake has gone unheeded by most of our park's managers when it comes to the streams in the park. 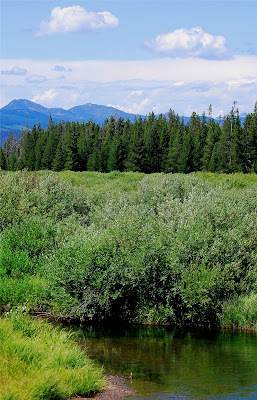 .. Maybe the beavers can help restore some perspective about the place of Yellowstone National Park in the effort to preserve our native species. .. 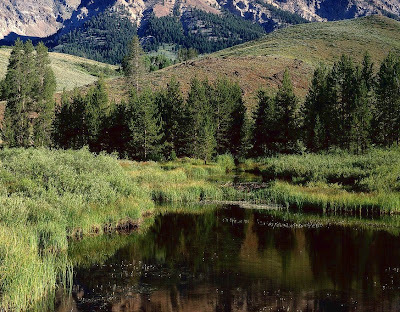 In a related note yesterday PROTECT YOUR WATERS points us to the robust program that Idaho is undertaking (PDF). 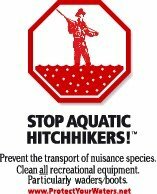 Although still aimed at the little critters such as New Zealand Mud Snails and plants such as water milfoil, it's a good start. .. It would seem that these programs are aimed at protecting, among other things, fishing in general - rather than protection and restoration of native species. 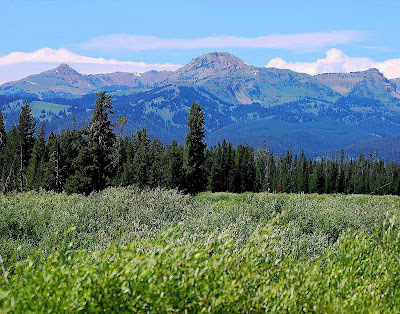 .. We'll continue to watch this effort and see if it holds promise for the Yellowstone region. .. The neighbors smile when they say: "We have two seasons in West Yellowstone - Winter & Road Work." Well, it's not Winter. .. 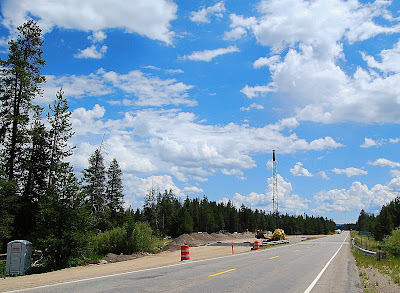 The road to Bozeman is being repaired, there's a new bridge & road alignment in the Gibbon Canyon, and the bridge over the South Fork of the Madison River is getting some much needed attention. .. The old Bridge Pool wasn't much as bridge pools go; it did offer a couple of easy fish though! .. The constriction slowed the river just enough for both upstream and downstream fishing & catching to be enhanced for a couple of hundred yards. We're awaiting the new flows to see if there is a significant change. .. The South Fork of the Madison River continues to provide good catching, even in the mid-day heat, (should you choose that sort of silliness.) Mornings are "mooseeee" and evenings are both "mooseeee" & "beareee." Loud noises and bear spray along with gallons of DEET and a head net are called for right now. .. Neighborhood tradition separates the river into two segments: above, and below the road. This separation covers part of the middle course and all of the lower course of the river. .. Hydrologically and physiographically there are four distinct river segments: never mind, above and below works just fine. .. 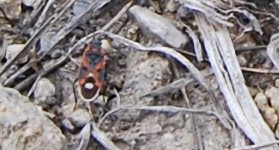 Right now there are a predominance of Spruce Bud Worms above the road, and the Grasshoppers are making themselves apparent below the road. These chompers of vegetation are superlative trout food. The trout love them - fisher folk should too. .. 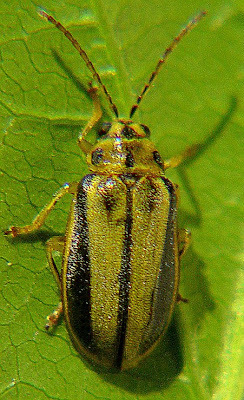 Despite the whining about dead trees, (it's part of the cycle,) the bugs provide for good catching opportunities. Now is that time. 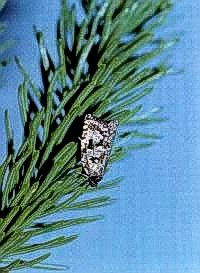 Soon it will be the Spruce Moth time. 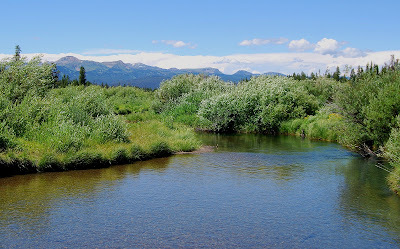 .. Caddis & Ants & Beetles continue to provide excellent trout food along the South Fork of the Madison River. The fish seem to be enjoying these unsurprising terrestrial delicacies without hooks in them. Perhaps we should provide some surprises. .. Catching is best below the road in the late afternoon and evening: the same can be said about above the road; with the caveat that the eager youngsters will practice their Rumba all day long with any one that tosses them something that will fit in their mouth. .. Or, for that matter something that they think will fit in their mouth. 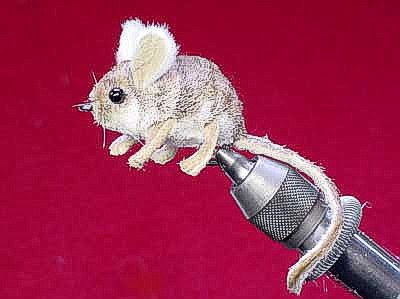 It is quite startling to discover a fish impaled on a hook who's fly is as big as the head of the poor little darling. .. Rumor has it that there are some mayflies in the morning below the road. We'll trust the reports since we would rather have some marmalade pancakes and a third cup of coffee. Besides that, there's rat killin' to do. It never ends. .. There are a couple of nifty backwaters that provide superlative mosquito hatcheries. The river segments adjacent to these areas will also provide catching opportunities. .. Use your rarely used mosquito patterns. The trout will eat them with gay abandon - if you can stand still long enough to present them with any sort of gentility. IT'S GOTTA BE DONE ! it needs periodic tending Enormous images - some suitable for wallpaper. .. Weekends are the traditional time to pay attention to yard work. Our backyard has been neglected for at least a month and it looks it. The weeds are too tall and about to go to seed. .. The bushes have grown together and look like a jungle. There are bugs everywhere and some of them bite. .. So we did our chores and spent a full day in the backyard. We got up early, tromped through the weeds, slashed through the bushes, and allowed a few bugs to bite us: it was worth it. .. The fish were appreciative of the attention and greeted us like they hadn't seen another soul in a week or two: they probably hadn't. 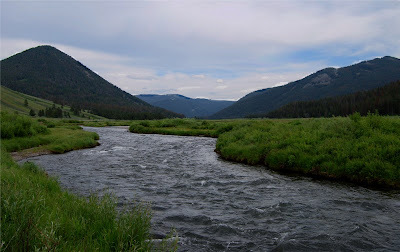 .. From it's origin at Dry Creek in Yellowstone National Park, to it's truncated termination in Hebgen Reservoir, the South Fork of The Madison River is a gentle and friendly stream. 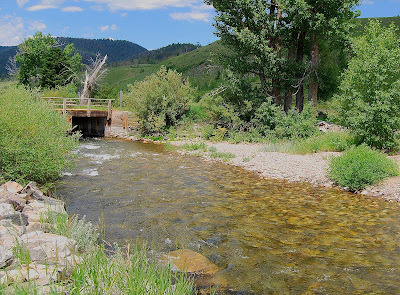 .. All Summer long the little fish grow as they snag the sparse nutrients from this creek. They are perpetually hungry and eat anything that fits in their mouth. It's a typical nursery fishery with ample adults to discipline the youngsters. .. Of course the adult residents occupy the choice spots: deep and dark undercut banks, holes of dark glassy water in longish runs and riffles, in the shade of dense overhanging bushes, and amongst the downed timber sweepers that seem to be everywhere. .. This is our backyard stream. Measured in "city terms" its about 16 blocks away. Here it's just part of the neighborhood. The kids have campfires and cookouts on it's banks. Many residents have been conceived along it's secluded shores. This is where the neighbors go to catch a bit of dinner - it's automatic. .. We spent 14 hours strolling around in our backyard. No one was there to interrupt our hard work. We saw a wandering neighborhood pooch - he was headed in the right direction and we didn't have a chance to pass some time with him. .. A bit of bushwhacking, a little up hill, a little down hill, a brief ride to another section, two lunches and a dinner on the shore in the shade: exhausting but fruitful and satisfying work was accomplished. .. This year's fry are just a bit over an inch long. The schools are currently breaking up into size classes. Buddy groups of 3's and 4's are everywhere. A few phalanxes of 20 to 30 were seen. As near as we can tell, they are healthy. .. Fish from the last three or four years are still hanging around. These 4" to 7" speed demons darted from beneath the banks as we approached. A few impaled themselves on monster flies when we were sneaky enough to get close. .. Some of the adults, (to 11 inches,) chose to dance with us. They were fierce and untutored in the rhythms of the mambo, and they did leaping pirouettes along with their best imitations of sprinters and hurdlers. .. The evening was full of caddis and mosquitoes. The fish and the swallows were eating both. The mosquitoes were eating us. We left as the sun dropped behind Lion's Head and called it a successful day of gardening in the backyard. .. The weekend looms for the neighbors. The visitors are cranky, gas is going up, motels are full, long lines are everywhere, argyle socks peek through sandals, (OHMYGAWD,) and tame rats disguised as dogs run free, pooping all over town: time to go fishing. .. Two Places come to mind. Hellroaring Creek = few fishers and a lovely bridge. 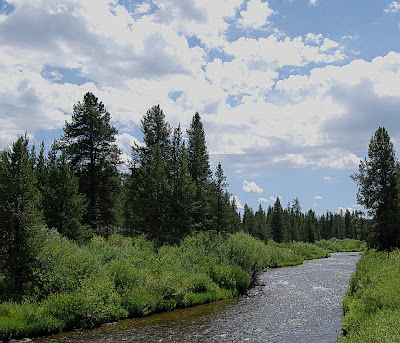 Fire Hole River = lonely Brook Trout and shade! 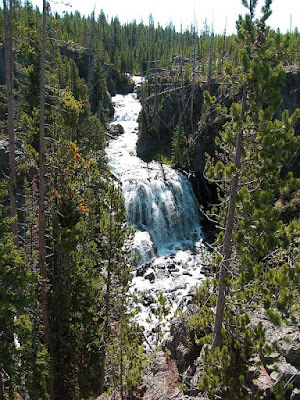 .. Enjoyment is rampant in Yellowstone National Park. The bison are enjoying some recreational goring of idiots, the bears are enjoying the high country away from the roads, the elk are enjoying the biting flies, the mule deer are enjoying startled fishers in the Barns Holes Meadows, and friendly vendors are enjoying snarling at non English speakers: must be summer. .. Avoid all the enjoyment and stroll above Kepler Cascades, or toward the Black Canyon. You have a choice = "hot and dusty" or "cool and shady." .. On the other hand, we're thinking of doing Winter Creek or Obsidian Creek. 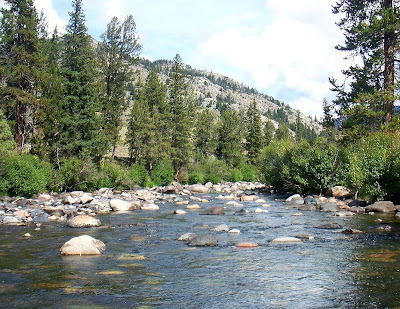 After all, the Gallatin River is full of enjoyable fishers and the bear is still guarding Fan Creek. .. See if you can stand it! Click image for exquisite detail ! This one's for U SUZ !! 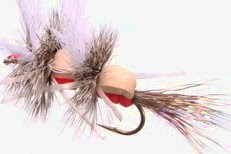 .. Just the thought of a trout that hasn't been fished over for several years will make many fishers salivate. It will conjure visions of monsters so gullible that they jump into your waders. .. There are, in fact, fish like that in Grayling Creek. They exist in the river just above and just below the park line. They exist in Grayling Canyon. They exist right next to the road if you know where the road is. .. The access is so simple that it's silly. On the other hand there are bits and pieces of this part of the river that require some skill in bushwhacking. These fish are fish ignored by the neighbors. .. These are fish bypassed by headhunters. These are fish happily doing their fishy thing with only the stray osprey, wolf, and grizzly bear to worry about. .. 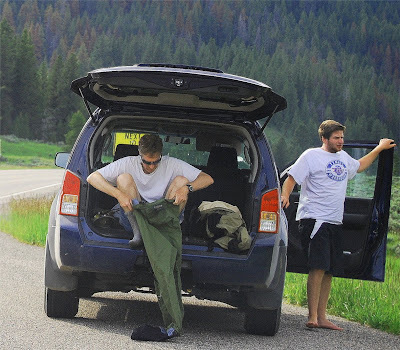 The fish in the Yellowstone Park section are protected by a dangerous and narrow road with few safe places to park. 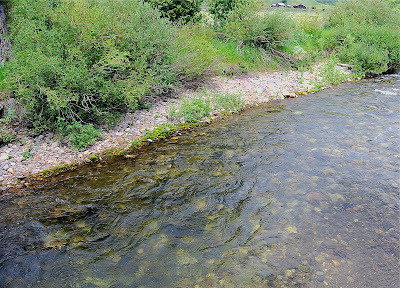 Downstream from the park boundary is Grayling Canyon. .. Access is nearly impossible from the upstream end of this area; entrance to the canyon from the downstream end demands miles of wading - or - making the acquaintance of some of the neighbors. .. Adjacent to Grayling Road are some fishable stretches. The dust is beginning to hang in the air as each pickup truck passes. It's not "postcard" fishing. It is, ladies and gents, postcard catching. .. 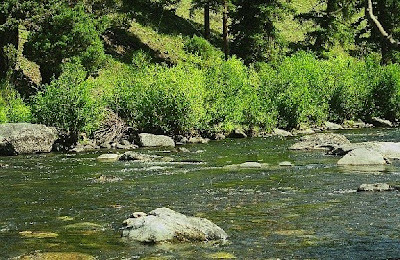 The riffles are thin, the pools are deep, the water is clear, the fish are eager, and the access is ridiculously easy. It's so easy that it's ignored by the neighbors. .. Bridges and culverts provide wonderful opportunities for fish to hide. They constrict the flow and provide well defined feeding opportunities. The trout figure this out and grow fat, dumb, and happy. Their location is predictable. It is consistent. It's too easy - unless you like to catch fish. .. The last two days have produced enough PMD's to clog your radiator. 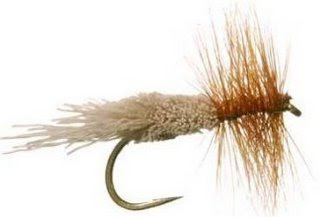 Over the weekend the caddis burrowed into your ears and nose with annoying persistence. There are few mosquitoes and no other fisher folk. .. We fish the road section with just a simple dry/dropper combination. 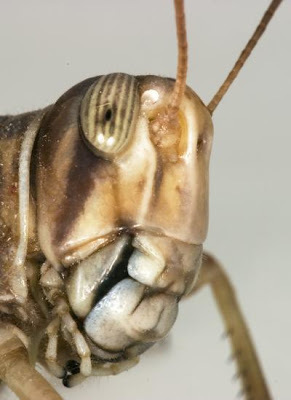 A Double Humpy or Hopper up top, and a Prince Nymph or Feather Duster down below. The fish are honest and guiless. They approach with a casual nonchalance that allows one to see the take. Casting is more akin to dropping. Fish will take at your feet. They will nibble the ends of your shoestrings. .. These are fish that see any invading presence as food. 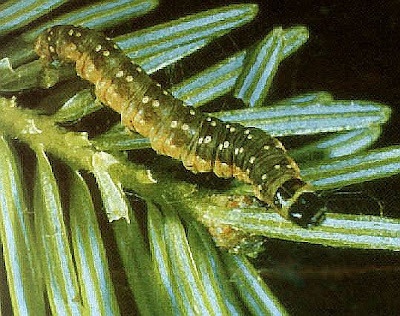 They occasionally attack low lying leaves and branches that dangle in the stream. There is activity everywhere. It's like watching pop corn. .. And, it happens all day. In the sun, in the rain, in the wind, and yes - in the snow. These are "unpounded" fish. These are fish that don't see license plates from Utah, Minnesota, Idaho, New Jersey, or Texas. .. These poor, innocent fish aren't scared stiff by shadows from anglers. They don't even know what an angler is. They don't even know that they are supposed to ignore Humpies and wait for the latest and greatest innovative fly. 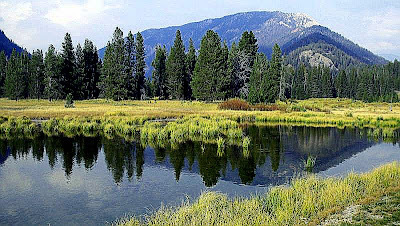 These are natural, innocent, honest trout that visitors often hike miles to find - we just park and fish. .. For the mass of fly fishers bigger is better. There are big fish here. There are even giant fish here. It's mostly a seasonal thing, but there are a few residents in the 15" range. And, There are zillions of fish in the 10" range. .. The hump into the canyon is rewarding. There are cascades, plunge pools, deep runs, shady pools, downfall, and nutrients aplenty. There are fish that come to see just what you are. There are also large and small boulders, slippery bed rock, slimy cobbles and the chance of meeting a bear or moose. So be it. .. Right now the trout in Grayling Creek, Fan Creek, Bacon Rind Creek, Duck Creek, Cougar Creek, and the Gallatin River, have it made. .. They have all the aquatic insects that cause fly fishers to wax poetic. They also have many juicy terrestrial snacks that are abundant. .. Now is when the these fish get fat. Now is when they store up energy for their sexual shenanigans of the Fall. 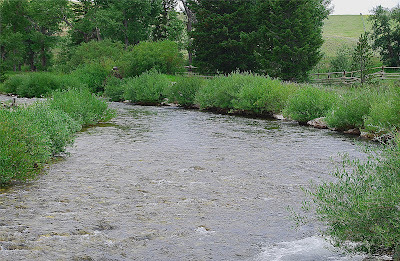 Now is when observation of the stream bank is of paramount importance for the fly fisher. .. On the other hand, if you choose to limit yourself to the 3% of the fish that are rising at any one time, ignore t he rest of this post. .. 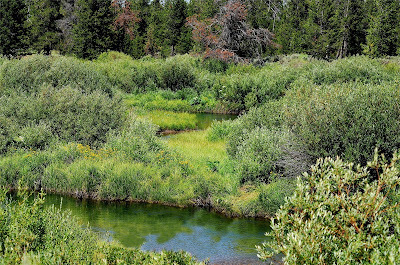 This year's wonderfully prolonged and damp Spring, coupled with the last few gentle, (but deep,) winters has produced a plethora of land and bush based critters that the trout love to see floating in the water column. .. Don your waders if you must. Do a little San Juan Shuffle if it suits you. Splash to your hearts content at all the "obvious" places. 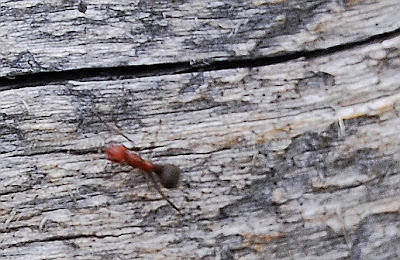 Or, prowl the banks looking for ant colonies that are precariously close to the water. 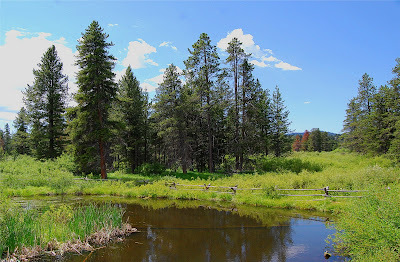 .. Just down stream from Black Butte we watched nice fish in about 8" of riffled water taking giant red and black ants. There were caddis on the water. There were fishers in the middle of the stream. the fish ignored both and gulped the ants as they came by. We caught several and moved on - didn't even get our feet wet. .. We're not sure what the aquatic Lazy Susan was offering - but it was small. We tossed a big yellow Woolly Bugger, (size 8, with a red tail,) and took a fish. We tied on a small Rainy's Hopper: took another. Nuisance that it was, we put a big Two-Tone Ant back on, and took another fish. These fish were enjoying a variety of eatables. We suspect that they hadn't read the books about keying on a specific type of food - oh well. .. As Summer blooms late in the high country we implore you to remember that the fish love to eat. They will eat sticks. They will eat spiders. They will eat anything that their little brain tells them "could be food." 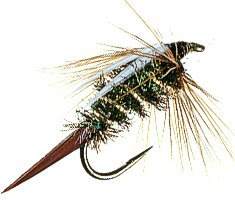 Of course if you choose, stick with the caddis - they're eating them too. 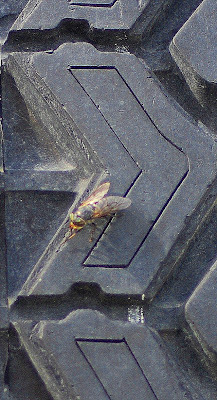 .. We also implore you to avoid the "Tire Eating Flies." They eat people too.